Amach! chair Maria Molloy and Rob Partridge, board member of LGBT Ireland and coordinator of the Galway branch. LGBT Ireland, the national organisation behind the LGBT helpline, and Amach! LGBT Galway, the group behind the Teach Solais resource Centre on Merchants Road, will hold a joint volunteer information and recruitment night. The event takes place in Teach Solais on Thursday July 5 at 7.30pm. LGBT Ireland and Amach! are reliant on volunteers to keep their services running and are seeking “dedicated people” who have “a few hours a month to spare” to come to meeting to see if they would like to help. 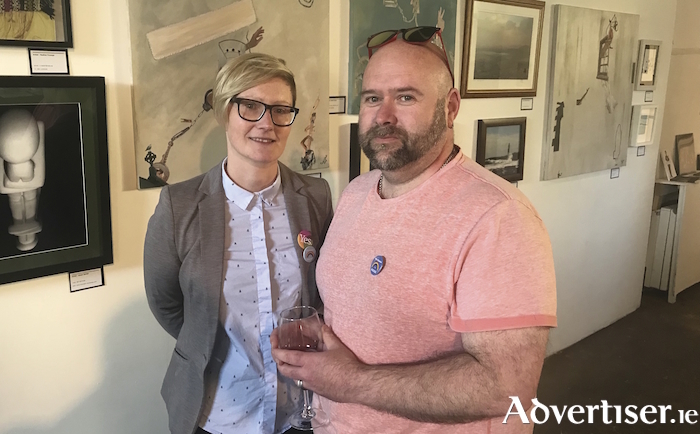 Maria Molloy, the current chairperson of Amach!, and Rob Partridge, board member of LGBT Ireland and coordinator of its Galway branch, will talk about the work of both groups and what volunteering will involve. LGBT Ireland runs peer support groups in the building and uses the facilities to train new volunteers, while its national helpline has been in operation since 2010. In 2014 it opened an office in Galway and answess calls nationally. “The helpline is open every day and offers a confidential non-judgmental support service to the LGBT+ community,” said Rob Partridge. Teach Solais hosts drop-in services, photography courses, yoga nights, and tie-dye sessions. Other services using the centre include AIDS West, Cosain, and ShOUT. “In order to maintain and expand on the great work being done in Teach Solais, we need more volunteers to help us deliver the vital services and fun activities we want to deliver,” said Maria Molloy. For more information contact Rob on 083 - 8161499, email at [email protected], or see the Amach or Teach Solais Facebook pages.